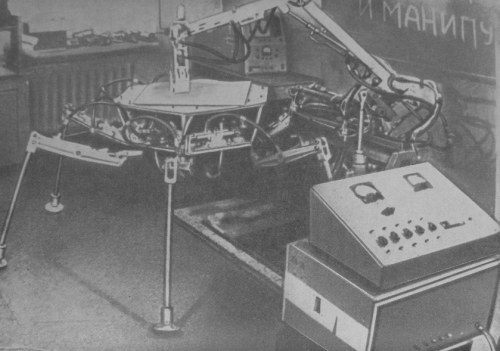 Six-legged walking machine of M. Ignatiev – FOP Shvachko V. V.
Adaptive walking machine with hydraulic actuator was designed by M. Ignatiev in USSR. Robot had 6 multilink “spidery” legs. PhD in Technical Sciences, Professor Mikhail B. Ignatiev is a specialist in the field of automatic and automated systems. He conducted research in the field of cybernetics, robotics, systems analysis and computer engineering. He created the world’s first underwater robot controlled by a computer (1968), the industrial robot with a visual adaptation (1970), the adaptive six-legged walking machine (1972), the first flexible automated metal workshop at the Dnepropetrovsk Electric Locomotive Plant (1979). 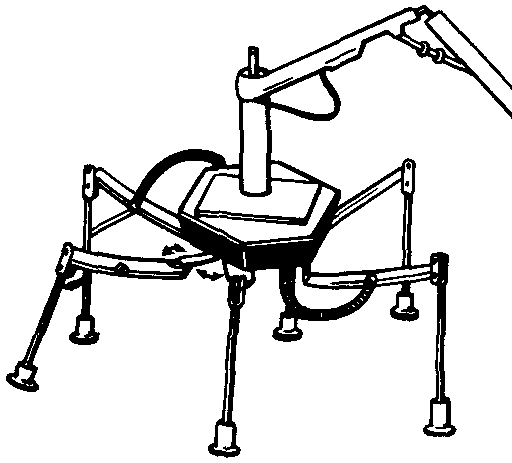 Six legs of robot are placed symmetrically around of the six-corner frame. Such structure provides ability of motion in any direction without change of stereotype of extremity‘s movement, but with change of consistency of extremity‘s action only. 1. Вукобратович М. Шагающие роботы и антропоморфные механизмы / М. Вукобратович. — Москва: Мир, 1976. – 544с. 2. Российский Пагуошский комитет при Президиуме РАН. — Mode of access: http://www.pugwash.ru/structure/presidium/1276.html. 3. Козырев Ю. Г. Промышленные роботы: Справочник / Ю. Г. Козырев. — [2-е изд.]. — Москва: Машиностроение, 1988. – 392с.